…Tends to stay in motion, right? That is, if Sir Isaac Newton knew what he was talking about, and I like to think he did. Otherwise, gravity has some ‘splaining to do. That’s been at the back of my mind lately. My philosophy is Keep Moving. At least a little. At least a tiny bit. Because is it me, or does life in general feel better when we move? Moving isn’t always easy this time of year, with the days slowly but surely getting shorter and the temperatures slowly (or not so slowly, depending on where you live) dropping. With most of the big fall marathons checked off and “perfect” – yes, this is subjective – weather slipping away, it’s easy to focus more on couch and kitchen than on any kind of physical activity. 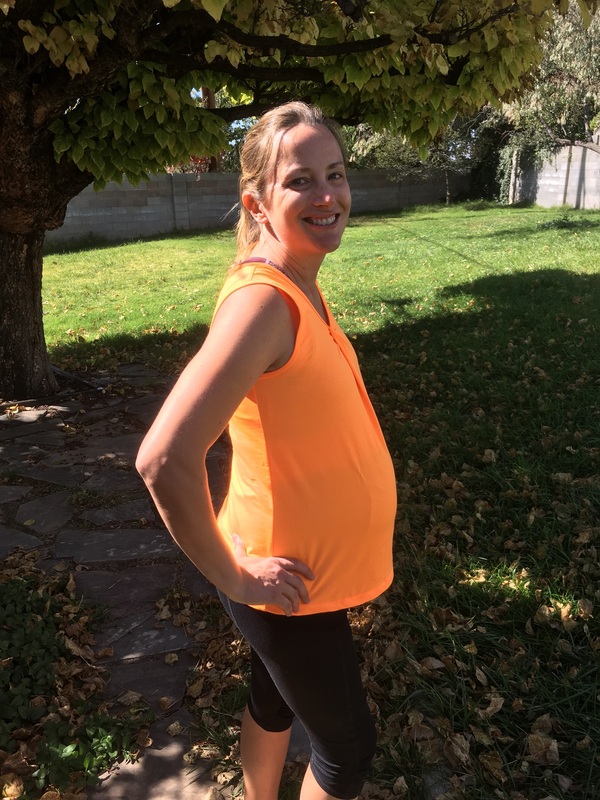 Throw in the energy roller coaster of the final weeks of pregnancy (or as I like to call them, “miles 19-26 of a marathon, with the hardest .2 EVER”), and hoo-boy, is it fun!! Thus the importance of Newton’s first law. What do I do to keep myself moving? I make it a priority to walk every day, even if it’s just my routine walk(s) with the dog. When time and energy permit, I go for a longer walk. I’ve also kept up with prenatal yoga (I’ve written a whole post about that, and I’ll probably write another one). It’s a different kind of movement, but it’s movement nonetheless, and I guard those Thursday nights – and the occasional Saturday afternoon – ferociously. No one messes with yoga time. But whether it’s lurching up the street at zero-dark-thirty with the dog or practicing different methods of breathing on a yoga mat, or even, ahem, dancing around in my kitchen, the result is always the same. It works mental magic. Exercise, in any form, is a simple, surefire, free(!) way to still the waters and rid them of pollution. Physically it helps, too. It’s energizing, it boosts the immune system, and for us preggos, it eases a whole lot of pregnancy complaints. Don’t get me wrong, rest is magnificent, and NECESSARY, no matter your life situation or fitness level. There are afternoons when I return from walking the dog and promptly lay down for a “quick cat nap” that turns into 40 minutes. There are mornings when I lay there, and then lay there some more. And I know my body and mind appreciate it. As long as I can move, I will. Because as long as I can move, I can handle colder weather and shorter days. As long as I can move, I can handle any to-do list. As long as I can move, I can handle the last 6.2 miles of pregnancy. As long as I can move, nothing seems ridiculous or impossible.